Aspiring millionaire: Do you have income protection insurance? Does your family rely on your income? Do you live on your own? What would you do if your income suddenly disappeared? 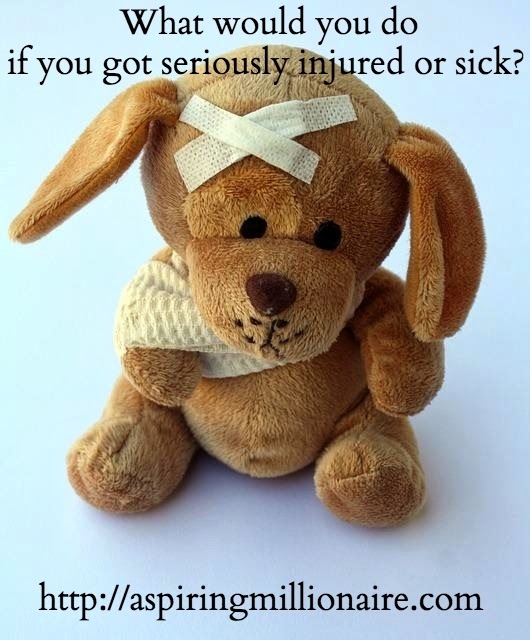 What if you got seriously ill or injured? On the weekend I had a car accident. It wasn't my fault and thankfully no one was seriously hurt, it did make me think though. The other drivers car insurance will cover it so I am not worried about my car or the actual accident. We were taken to the hospital (my daughter had chest pains and marks from the seatbelt, but was ok). I was put in a neck brace because of neck and back pain. Laying on a stretcher, unable to move made me think about my family. My daughters were put on 2 chairs just behind me and I was helpless. They were fighting, arguing and causing a lot of noise. A few nurses offered icy poles and got them blankets when they needed, but I couldn't do a thing. I realised how severe my situation could be if anything were to happen, if I were seriously injured or suffered an illness, how would my family cope? Financially, I have some passive income and there are government payments, but those payments are not equal to income. They are aimed at helping you survive. 1.) Get adequate cover. Don’t just go for the cheapest option, get what you need and are eligible for. 2.) Live on less than you earn. You will get up to 75% of your income. If you are living on 100% of your income and not saving anything, you need to change that quickly and not just because of the insurance but because you need to save! 3.) Have an emergency fund. There is a 30 day waiting period before insurance will kick in. Insurance claims can take time and with at least 30 days of no payment, you need something. You do have sick and holiday leave you can use from work, but it is important to have your own savings. 4.) Package your insurance. Having multiple policies with one insurer can produce significant discounts. Always compare to make sure you are getting the best deal across the board and are covered for everything you need. With your comparisons make sure you take into account theses discounts to get a clear idea of your premiums. 5.) Get healthy. Just like health insurance, income protection insurance premiums are lower for non smokers and those who are healthy or try to live healthy. Your risk of many diseases are lower, making you less of a risk to the insurance company. Do you have income protection insurance? Have you heard of it before or ever had to use it? Having insurance is very important. At the time, it is just my wife and I and we each have our own jobs, so we don't have the need for insurance. But, we plan on starting a family later this year and will most certainly be getting insurance at that time in case something happens to one of us so the other person can afford to raise our child. Glad to hear you and your family are safe. This does make me think some...we've got a growing family, but not much insurance set up (just life for me). I've just been putting it off because I didn't want to deal with the hassle, but that's a pretty lame excuse should something ever happen. That's great Jon. It is interesting how when we start a family, there are so many things that didn't matter as much when we were single or part of a couple but once you have a baby, you need. Thanks Mr. Utopia. When my family was young we didn't have much insurance, but now being single, I certainly think differently! Glad to hear that you were OK. My employer provides us some accident insurance, and we just completed the process earlier this year of taking out life insurance policies in the event that something happened to my wife or I. With two preschool age children, this is not a nice-to-have, it's a must-have. Good to hear you and your daughters were okay. Car accidents can be scary. We have a couple of accident insurance policies that cover hospital visits and sick days, but not necessarily income insurance. I'll have to look into this. Though we have multiple streams of income, any kind of accident or illness would disrupt those streams for a while. That's excellent Jon. It is exciting how when we begin children members, there are so many factors that didn't issue as much when we were individual or aspect of a several but once you have a child, you need. thanks for this nice post.